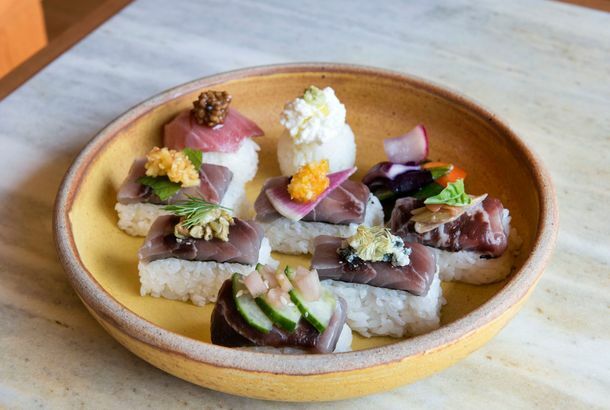 Affordable, Exciting Sushi Lands in WilliamsburgThe priciest omakase at Okozushi is just $45. Adam Platt Ranks 6 of Our Favorite New Tasting MenusOver the last several months, newly refurbished tasting ateliers, discreet dining bars, and elaborately conceived chef’s menus have been popping up with such frequency that it’s hard to keep track of them all. Yuji Ramen Will Pop Up at Okonomi Beginning Next WeekThis is great news for fans of Yuji Haraguchi’s inventive noodle dishes. Yuji Ramen Will Close Both Whole Foods Locations This MonthHaraguchi will integrate his ramen dishes at his brick-and-mortar in Williamsburg. The Other Critics: Wells Reviews Ramen; Steve Cuozzo Gives All’onda TwoPlus: Reviews for Narcissa and Margaux in this week’s roundup. Ramen Map of NYC Improves Your Noodle GPSGet your slurp on. The Underground Gourmet’s 2013 Cheap Eats ListA roster of extreme deliciousness (at modest prices). Yuji Ramen Serving Ramen Omakase at Whole Foods Bowery Through AugustMore dinners, more noodles. Antica Pesa Serves Brunch; Yuji Ramen at Whole Foods Extends HoursPlus: Dale Talde is ‘Food & Wine’ regional winner, and more, in today’s Leftovers. The Truffle of the Sea: 12 Awesome New Uni Dishes in New York CityIt’s the expensive icing to bone marrow, scrambled eggs, and pasta. Yuji Ramen Is Raising Money on Kickstarter for Its New Noodle ProjectThe Smorgasburg regulars are looking for a permanent place to simmer their broth. Cold News: Yuji Done at Kinfolk StudiosJust when we needed the refreshment of cool mazeman noodles the most!